Tom Kreisler , Dancing Dogs, 1984, Collection of the Sarjeant Gallery Te Whare o Rehua Whanganui. As newly employed Collection Transition Assistants one of the first tasks the Sarjeant had us do was input insurance valuations for the collection in its entirety. No small feat this task allowed us to digitally examine each and every artwork in the collection and familiarise ourselves with the works which we would later pack and move to Sarjeant on the Quay. 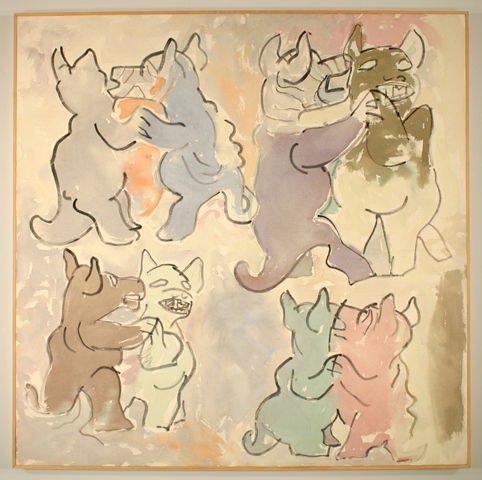 Dancing Dogs by Tom Kreisler particularly caught my attention during this valuation process. I first spotted the work as a thumbnail on my screen sitting amongst a mass of landscapes and portraits. The light pastel tones and humorous subject matter won my heart and despite almost completely clearing out all the artworks in the Queens Park basement it is still a firm favourite. Argentinian born Kreisler came to New Zealand in 1952 and graduated from the University of Canterbury School Of Fine Arts in 1965. He moved to New Plymouth in 1968 where he taught art at New Plymouth Boys’ High School and later at the Taranaki Polytechnic. His students included Paul Hartigan whose work also features in the Sarjeant Gallery’s collection. In 1990, Tom and his wife Lesley set up the Lesley Kreisler Gallery. As well as the Sarjeant, Kreisler’s work also features in other New Zealand institutions including the Govett-Brewster Art Gallery in New Plymouth and the Auckland Art Gallery. The pastel acrylics and dyes Kreisler chose for Dancing Dogs aids in the work’s humorous and light hearted nature, something which can be seen in many of his other works. As well as painting euphoric dogs Kreisler used poetic phrases such as “he didn’t change his life he changed his pants” and “first we heat you then we eat you”. His later works rendered images of pastel hued skeletons eating hamburgers and holding brooms. Often, Kreisler’s cartoon style of drawing also hints at deeper and darker themes. The skeletons reference death as do the happy dogs in Dancing Dogs. Kreisler’s execution of his twirling dogs is faithfully based on the traditional Mexican funeral ceramics found in the Western state of Colima. These effigies of loyal Mexican hairless dogs depicted in a dancing embrace were often buried in tombs to guide and accompany their master’s soul to the afterlife. Dancing Dogs was exhibited at the Sarjeant Gallery in 1984 for the Wanganui Art Awards and purchased for the Sarjeant’s permanent collection. The work has since been displayed on numerous occasions including the solo Not a Dog Show at the Govett-Brewster in 1986 and The Cartoon Show at Auckland Art Gallery in 2001. Sadly, Tom passed away in April 2002. Almost five years after his death his youngest son, Aaron Kreisler, curated the first major survey of his work. The exhibition, simply titled Tom Kreisler, featured large scale paintings, including Dancing Dogs, alongside working drawings and note books, and was first shown at the Govett-Brewster in New Plymouth in 2007.